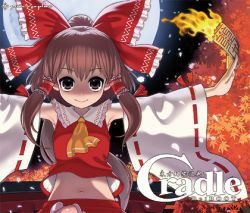 10th Anniversary re-release edition of Cradle -Touhou Gengaku Shiten- and Cradle2, with few removed songs ("Rearranger unreachable" or "permission denied because work is too old") and 5 works from Touhou Gensou Shiten 2 "Canon" and 10 new tracks. Track 1.12, "妖々跋扈 ～ Speed Fox! ", was used in a special version of Touhou Youyoumu used for a score attack tournament at the first Hakurei Shrine Reitaisai on April 18, 2004. Disc 03's contents are identical to previously released Cradle2 album. Track 4.11~13 4.15~16 were previously released, from Touhou Gensou Shiten 2 "Canon"